Using a chainsaw is hazardous, even the most experienced operator can become careless and oblivious to the dangers, especially with a repetitive task such as logging. Prolonged periods of using a heavy chainsaw can also result in backache and increase the likelihood of short cuts being taken and increasing the chances of an accident. The Portek Logmaster can help overcome these problems and is probably the safest sawhorse available. 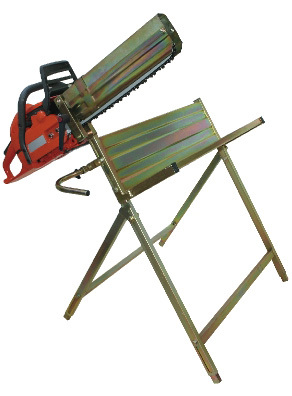 The chainsaw is clamped to the sawhorse and the weight of the saw is then carried on the frame, leaving the operator free to hold the log in position with one hand and swing the chainsaw through the log with the other. This simple solution makes logging easier, faster and safer. 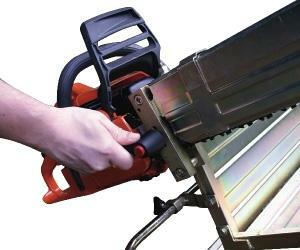 For a demonstration of this product, please click this link http://www.portek.co.uk/logmaster.html. Delivery of this item is FREE to mainland UK destinations (Highlands and Islands extra). Please allow three/five working days for delivery. Please note that the Portek Sawhorse is only available from us for this price when ordered online.